Chiquinquira is the fourth largest town in the department of Boyaca with a population of around 60,000. It lies at an altitude of 2,500m giving it a cool climate. The town's principal attractions are its churches which are among the most important in the country. Situated on the Plaza Bolivar (the town's main square) is Basílica de la Virgen de Chiquinquirá. The Basilica is particularly interesting on the inside where the famous Virgen de Chiquinquirá painting is displayed. The Basilica was visited by Pope Juan Pablo II on 3 July 1986. The painting was painted by a Spaniard by the name of Alonso de Narváez de Andalucía around 1560. A few years later, however, the painting had seriously deteriorated due to the humidity and the image of the Virgin was barely recognizable. Legend has it that in 1586 a Spanish lady called Maria Ramos decided to restore the painting by praying for the Virgen del Rosario to appear. On 26 December she was leaving the church in which the painting was kept when a passer-by starting shouting and calling her to look back inside the church. The painting had miraculously been restored in all its glory. The church in which the story took place is now known as the Iglesia de La Renovación It is located just a couple of blocks from Plaza Bolivar in Parque Julio Florez which takes its name from a famous poet from the town of whom there is a bust in the centre of the park. Looking up to the left from the steps of the Basilica in Plaza Bolivar you can see El Santuario de Santa Barbara perched atop a small hill. The town is about an hour's drive from the picturesque colonial town of Villa de Leyva. 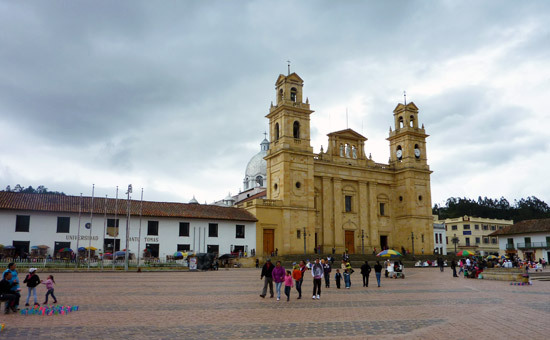 The town receives many Colombian visitors for its religious history and has a number of small basic hotels. For something a little more upmarket try the Gran Hotel, a large, comfortable hotel with a central location.